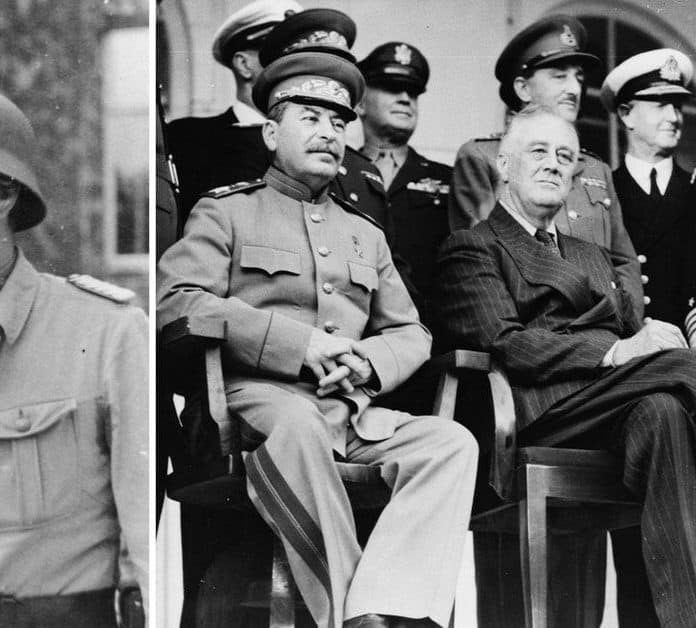 The Tehran Conference, November 28th to December 1st, 1943 was the first meeting of World War II’s “Big Three” Allied leaders, FDR, Stalin, and Churchill. Over the course of multiple sessions major issues of common strategy were hammered out. Chief among them was a solid commitment by Roosevelt and Churchill to open a major second front against Germany by invading France in 1944. Also addressed were the envisaged postwar settlement, and smaller issues such as operations in Yugoslavia, relations with Iran and Turkey, plus Japan. All in all, it was a successful conference that bore fruit and advanced the Allies’ cause. It almost ended in disaster. The Germans got wind of the planned conference, and put their extensive intelligence network in Iran to report on security measures for protecting the Allied leaders. German agents were parachuted into Iran to lay the groundwork for a commando strike led by Otto Skorzeny, Germany’s premier special forces operative, to take out the Big Three. It did not happen, because the Nazis’ plans were foiled by a teenage Soviet spying prodigy, Gevork Vartanian (1924 – 2012). Gevork Vartanian was born in 1924 to Armenian parents near Rostov, in southern Russia. His father worked for the NKVD – predecessor of the KGB and today’s FSB and SVR. In 1930, Gevork’s family moved to Iran, where his father, under the guise of an Armenian businessman, spent the next 23 years working as a Soviet intelligence agent. The son followed in his father’s footsteps, and in 1940, 16 year old Gevork was recruited by the senior Vartanian into the NKVD. Gevork started off as a recruiter, signing up Iranians and foreign residents as Soviet agents and assets. He proved an excellent recruiter, notwithstanding his youth. In 1941, the USSR was thrust into WWII when the Germans launched a devastating surprise attack, Operation Barbarossa, that came close to completely overwhelming the Soviet Union. The Red Air Force was all but annihilated in the opening days of the onslaught, and Red Army formations along the USSR’s western border were shattered or bypassed, to be encircled and mopped up later. Within weeks, German armored columns had penetrated hundreds of miles into Soviet territory, and Soviets casualties rapidly rose into the millions. Soon, the Soviets were hanging on by the skin of their teeth, at the brink of collapse at any moment. In that dire summer of 1941, running low on everything as their stockpiles were destroyed and their factories overrun or hurriedly evacuated to keep them out of German hands, the Soviets were in desperate need of any assistance. It was against that backdrop that Iran, on the USSR’s southern border, took on special importance as a secure route through which to funnel supplies to the hard pressed Soviets. Accordingly, the Soviets and British jointly invaded Iran in August of 1941 to secure its oilfields, and ensure that an Allied supply route to the USSR through Iranian territory was kept open. The invaders deposed the Iranian ruler, or Shah, and replaced him with his more pliant son. Iran was then divided between the British and Soviets. Understandably, the invasion and occupation did not sit well with a majority of Iranians, and the affections of many gravitated towards Germany, the enemy of the foreigners occupying their country. German intelligence had a field day recruiting in Iran, as the numbers of German sympathizers exploded. Gevork Vartanian’s workload increased, and his assignments were expanded from recruitment to include counterintelligence as well. The teenager proved himself a counterintelligence prodigy, and a veritable Pac Man at sniffing out and busting enemy spooks. By early 1942, Gevork’s team of seven intelligence operatives had identified over 400 German agents in the Soviet zone, all of whom were then rounded up by Soviet troops and security personnel. In 1943, Gevork was given a new assignment: ensure the security of the upcoming Tehran Conference by identifying and nipping in the bud any enemy plans to disrupt the Big Three’s meeting.